We are a renowned name to offer our patrons with an outstanding range of Water Treatment Plant that are manufactured in total conformity with the industry laid parameters. In addition to this, our team mates make use of qualitative raw material that is sourced from authentic vendors of the market to fabricate these treatment plants as per clients needs and preferences. Moreover, this offered range conforms to the standards and norms of the industry in an effective manner. 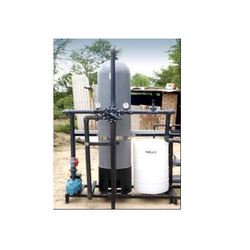 Furthermore, this product line comprises Reverse Osmosis System (Industrial), Drinking Water System, Filtration System, Softening System, Fluoride, Iron & Arsenic Removal Filtration System and others. We at BIOTIC WATER, provides broad range of custom-built Mixed Bed Units for high purity industrial process water & utility applications.Our exclusive design of Mixed Bed plant ensures the maximum utilization of the High bed depth, effective surface area, uniform space and linear velocity across the resin bed,which provides effective contact time between water and resin bed yield high purity water for sensitive process application i.e. WFI (water for Injection) High Pressure Boilers, EC circuits etc. BIOTIC MB Plants are available in diameters from 0.225 Mts. to 2.0 Mts. with the flow ratesup to 150M3/Hr. and OBR up to 1500 M3@40 PPM TDS. These strong, pre-engineered, pre-assembled units minimizeinstallation and start-up costs. Our D.M. Plant is acclaimed in the market for cost efficiency and consistent functioning. A mixed bed exchange has both cation and anion resin mixed together in a single vessel. As water flows through the resin bed, the ion exchange process is repeated many times, “polishing” the water to a very high purity. During regeneration, the resin is separated into distinct cation and anion fractions. The resin is separated by back washing, with the lighter anion resin settling on top of the cation resin. Regenerate acid is introduced through the bottom distributor, and caustic is introduced through distributors above the resin bed. The regenerate streams meet at the boundary between the cation and anion resin and discharge through a collector located at the resin interface. Following regenerate introduction and displacement rinse, air and water are used to mix the resins. Then the resins are rinsed, and the unit is ready for service. Counter flow and mixed bed systems produce a purer water than conventional cation-anion demineralizers, but require more sophisticated equipment and have a higher initial cost. The more complicated regeneration sequences require closer operator attention than standard systems. This is especially true for a mixed bed unit. Pre-chlorination - For algae control and arresting any biological growth. Aeration - Along with Pre-Chlorination for removal of dissolved iron and manganese. Coagulant aids, also known as poly electrolytes - To improve coagulation and for thicker floc formation. Sedimentation - For solids separation, that is, removal of suspended solids trapped in the floc. 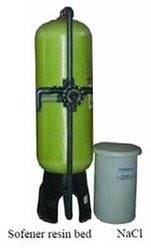 Filtration - Removing particles from water. Desalination - Process of removing salt from the water. Disinfection - For killing bacteria. The process of removing divalent cat ions, usually calcium or magnesium, from water. When a sample of water contains more than 120 mg of these ions per liter, expressed in terms of calcium carbonate (CaCO3), it is generally classified as a hard water. Hard waters are frequently unsuitable for many industrial and domestic purposes because of their soap-destroying power and tendency to form scale in equipment such as boilers, pipelines, and engine jackets. Therefore it is necessary to treat the water either to remove or to alter the constituents for it to be fit for the proposed use. 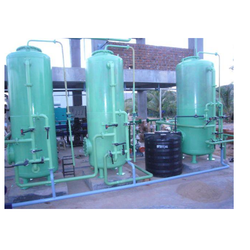 DM Plant is an Ion exchange technology used to remove salts (cations and anions) from water. Soluble chemical compounds, when dissolved in water, become ionized; that is their molecules dissociate into positively and negatively charged components called ions. Consider common table salt, sodium chloride. In its solid form, this compound consists of one sodium atom (Na) and one chlorine atom (Cl) tightly coupled together (NaCl). When dissolved in water, however, the compound splits into two ions Na+ and Cl- A Typical two-bed DM Plant consists of two FRP vessels connected in series along with its internal fittings. The first unit consists of high capacity strongly acidic cation exchange resin, which converts positive ions of salt and replaces them with hydrogen ions to form respective acids, which are absorbed in next vessel by strongly basic anion exchange resin. The water obtained by this process shows conductivity less than 30 µS/cm and Total Dissolved Solids less than 10 ppm. 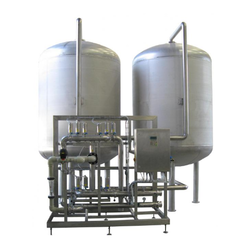 Further high purity water can be achieved by Mixed Bed Deionizers, which are designed to produce high purity treated water. They can be used as polishing units after two beds DM Plant to obtain high purity water.